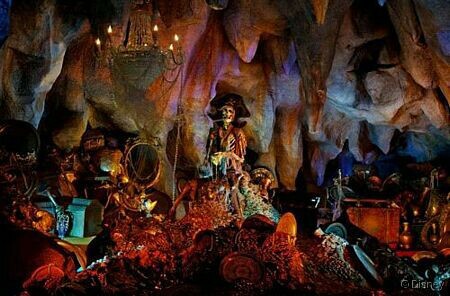 Here’s our pick of the 10 best rides and attractions for teenagers at Disneyland Paris. Of course, not all teenagers are the same, and if you’re a rare teen who doesn’t like rides and roller coasters, then this list isn’t for you! Riders board a rocket and get launched into “space” at 68km per hour, experiencing a G-force of nearly 1.3 N. Along the way, they will encounter an asteroid belt, comets and a magnificent supernova. 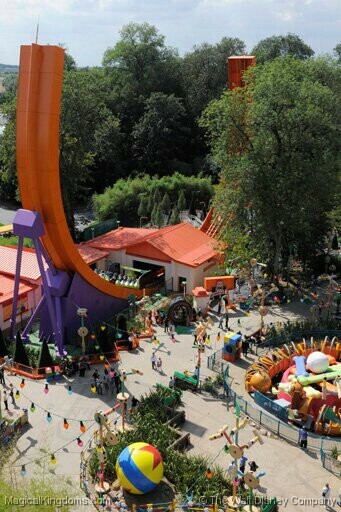 The ride features twists, turns, spins, and two inversions, and isn’t one for the fainthearted! An out of this world soundtrack plays from the speakers mounted to each “rocket,” and amazing lighting effects make the riders feel like they’re flying through space as they travel at up to 70 km per hour. For a shorter ride than Big Thunder Mountain, hop aboard a mine car and imagine you’re Indiana Jones as you speed through ancient ruins. 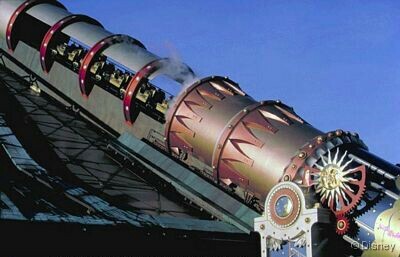 This was the first roller coaster in a Disney park to feature an inversion, and riders can also enjoy sudden drops and hairpin bends. One of the newest attractions at Walt Disney Studios, in the new Toy Story Playland. The race to the top of an exhilarating 25-meter half pipe on a U-shaped circuit is sure to leave your adrenaline pumping! Check into this early 20th century hotel and take a seat in the elevator. But be warned, this is no ordinary elevator! Once it’s climbed to the 13th storey you’ll get a brief glimpse of the outside world when the doors open, before you plummet downwards at high speed. A random eries of rises and drops follow in this hair-raising ride. 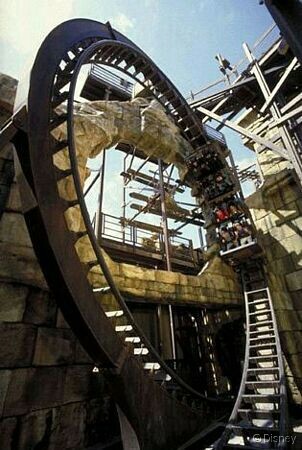 Travel at up to 40 mph on a runaway mine train through an abandoned mine complex in the Wild West. This Paris version of the well known attraction is much bigger than its American and Japanese counterparts, and takes riders under the Rivers of the Far West. Will you get out before the tunnel collapses? Guests may be fooled into thinking this is a tame ride, after all it’s themed after the film Finding Nemo, about a cute little fish. They’d be wrong! The latest coaster technology was used to design this ride that takes guests on a rip-roaring ride through the East Australian Current, spinning, twisting, turning and dropping along the way. This attraction was just made for teenagers! Combining rock music and a fast roller coaster, you’ll enjoy a high-speed launch on the fastest roller coaster ever built for a Disney park, reaching speeds of up to 100 kilometres per hour. As you enter the first inversion, experience 4 to 5 Gs, more than an astronaut does on a space shuttle launch. 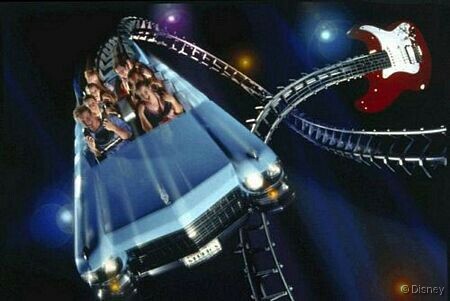 The coaster features two loops, inversions and a corkscrew, all in the dark, with Aerosmith tunes pulsating from the five speakers in each Soundtracker vehicle. Take a break from the rides and have a seat to watch this spectacular stunt show. 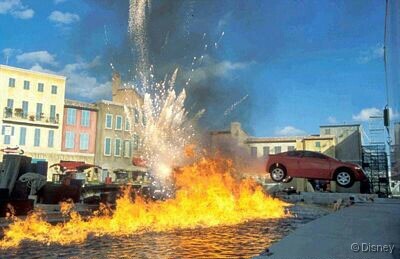 Featuring cars, motorbikes and jet skis, the stunts were designed by Rémy Julienne, the famous French Stunt Designer who worked on many of the James Bond films. There’s plenty of action and explosions, and you may even get chosen to take part in the show! Learn a bit about how special effects are created for movies, before you step into a full-size set of the Russian space station. The space station suddenly gets hit by a meteor shower and you find yourself experiencing some of those special effects. This entry was posted in Disneyland Paris by Nick. Bookmark the permalink.